The text below the screen says: “In the worst case, it [the corium] may have reached 65 centimeters from the surface of the concrete. Where the concrete is the thinnest, it may have reached within 37 centimeters from the steel plate [of the Containment Vessel]. The “surface of the concrete” turns out to be the surface of the bottom of the groove that is X centimeter deep. 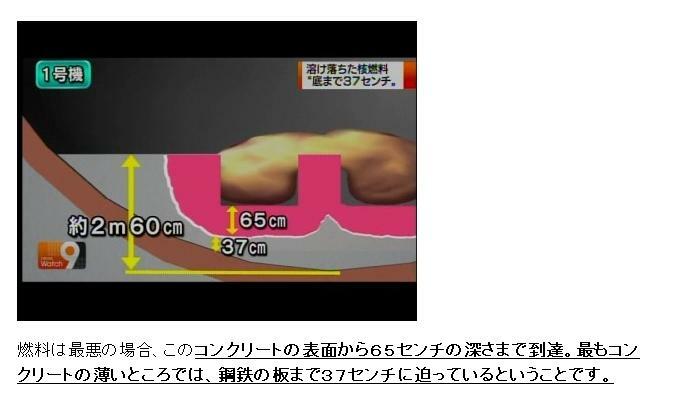 Well, it does look like the Institute of Applied Energy is more right than TEPCO in saying the corium has eaten 2 meters into the concrete. And perhaps people like Hiroaki Koide of Kyoto University and the engineers who designed the reactors at Fukushima I Nuke Plant may be more right than the Institute of Applied Energy, and the corium has indeed escaped the Containment Vessel long time ago. The fast erosion phase of the concrete basemat lasts for about an hour and progresses into about one meter depth, then slows to several centimeters per hour, and stops completely when the melt cools below the decomposition temperature of concrete (about 1100 °C). Complete melt-through can occur in several days even through several meters of concrete; the corium then penetrates several meters into the underlying soil, spreads around, cools and solidifies. During the interaction between corium and concrete, very high temperatures can be achieved.